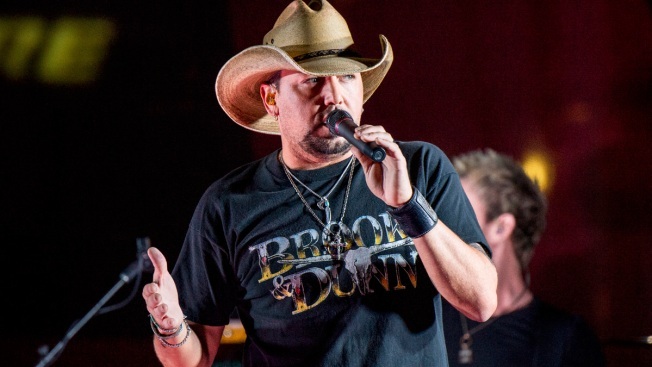 In this June 7, 2017 file photo, Jason Aldean performs during a surprise pop up concert at the Music City Center in Nashville, Tenn.
Jason Aldean's moving rendition of "I Won't Back Down" on "Saturday Night Live" will soon be raising money to help victims of the Las Vegas shooting. The song was made available on Friday on various sites. Aldean's representative says all proceeds will be donated to the Direct Impact Fund dedicated to victims of the tragedy. Aldean was performing at the Route 91 Harvest Festival on Oct. 2 when a gunman fired on the crowd a hotel room, killing 58 people. Hundreds more were injured. The country star made his first public performance on "SNL" five days later and sang the Tom Petty song. It was in part a tribute to the late rocker, who died that week, but also a show of resiliency in the face of tragedy.